SellerCloud is an ecommerce solution that is dedicated to help online retailers. It offers synchronization, simplification, and automation functionalities that enable retailers to meet the challenges facing their business, especially if they have a multichannel selling operation. 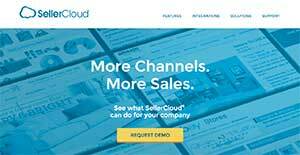 SellerCloud’s innovative platform provides a powerful set of tools to manage the full scope of multi-channel selling. From inventory and warehouse management, publishing listing to marketplaces, to order processing and shipping, as well as accounting integration, the software does all the work needed. In addition, its one-system solution simplifies complex ecommerce operations, empowering business to have a better view and control on their online sales. SellerCloud provides a single point entry catalog for all product specs; its catalog management provides a central database for all your product information, including descriptions, images, prices and details. This eliminates the need to re-enter information for each channel individually. Users can even set shipping preferences for each product. While the software also offers a unique dynamic inventory system where we can track inventory that is both user facing and customer facing. SellerCloud also provides purchasing functionalities with a full purchase order management functionality. It also provides guidance on reorder quantities with low stock alerts and predicted purchasing based on past sales or season. Its seamless integration with all leading sales channels makes it easy to give any inventory the maximum exposure with one central engine to manage all the listings, orders, and inventories. It also allocates an item to the sales order once sold to minimize the risk of overselling and eliminates the need to manually update availability amounts in each store or channel. Orders and shipping are automated for convenience of the user retailers and their customers. In addition, SellerCloud´s reporting module collects all the data points, from item costs to sales to commissions and shipping fees, and provides a wide range of reports to track product performance, sales, top selling products, detailing the profit and loss of a product per order and much more. Each company has different requirements and needs a system that can be personalized for their size, type of workers and customers, and the particular industry they are in. For these reasons, no software can provide perfect tools out-of-the-box. When you try to find a software system, first be sure what you require it for. Read some SellerCloud reviews and ask yourself do you desire basic functionality or do you require advanced functionality? Are there any industry-specific tools that you are seeking? Find the answers to these queries to help your search. There are lots of factors that you need to consider and these include your finances, specific business needs, your organization size, integration needs etc. Take your time, check out a few free trials, and finally zero in on the system that presents all that you require to enhance your organization competence and productivity. How Much Does SellerCloud Cost? We realize that when you make a decision to buy Sales Management Software it’s important not only to see how experts evaluate it in their reviews, but also to find out if the real people and companies that buy it are actually satisfied with the product. That’s why we’ve created our behavior-based Customer Satisfaction Algorithm™ that gathers customer reviews, comments and SellerCloud reviews across a wide range of social media sites. The data is then presented in an easy to digest form showing how many people had positive and negative experience with SellerCloud. With that information at hand you should be equipped to make an informed buying decision that you won’t regret. What are SellerCloud pricing details? What integrations are available for SellerCloud? If you need more information about SellerCloud or you simply have a question let us know what you need and we’ll forward your request directly to the vendor.